The more resistant, light-colored cap rock slows down the erosion of the underlying reddish-brown conglomerate layer. Photo courtesy of Amanda Wilkerson. 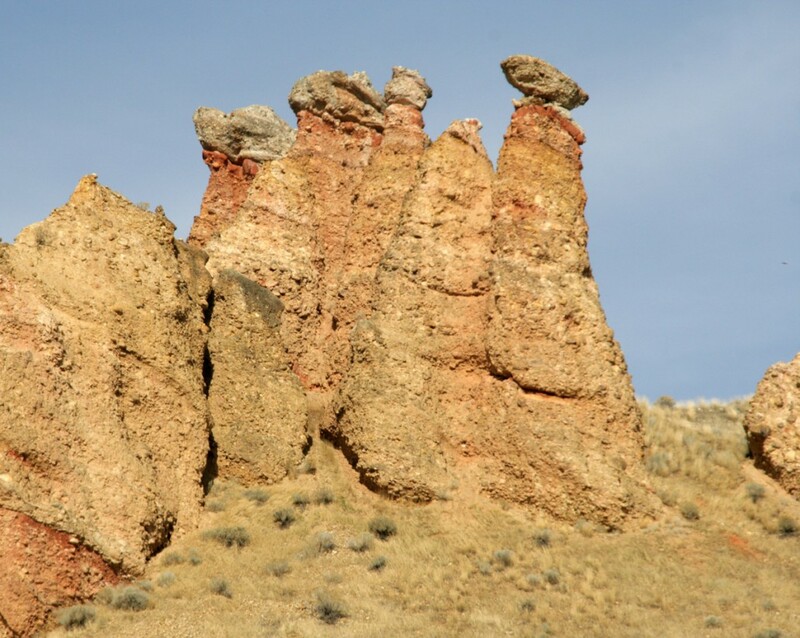 Near the town of Echo in northern Utah is a cluster of reddish-brown natural monuments called The Witches (also known as Witch Rocks, Witches Rocks, Witch Bluffs, or Witches Bluffs), composed of the Henefer Formation. In 1858, army Captain Albert Tracy described them in his journal as “witch-like” and “so singularly like figures in kirtles [long skirts] and steeple-hats, or bonnets that they have received the appellation [Witch Rocks]”. By using your imagination (and perhaps squinting a bit), you can picture a coven of witches in long robes and witches’ hats standing on the hillside. 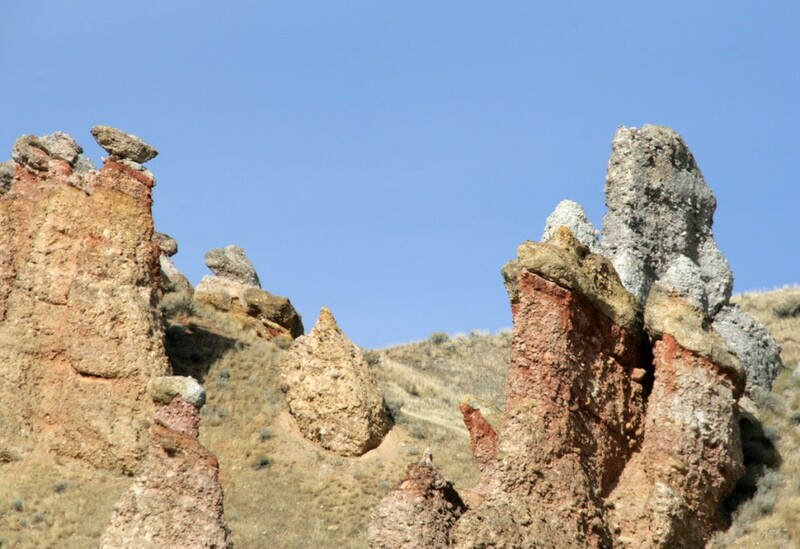 Nearby Echo Canyon has long been used as a main thoroughfare between southern Wyoming and northern Utah, first by Native Americans, fur trappers, and explorers, then by wagon trains on their way to Salt Lake City or other points west. Before the interstate highway, passengers on the Overland Stage and then the Union Pacific Railroad also made their way through the canyon. 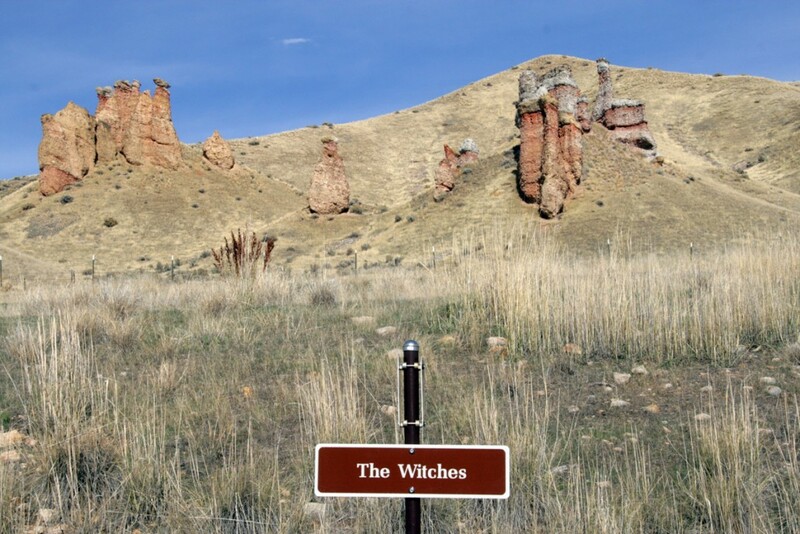 At the town of Echo, the canyon opens into the Henefer Valley where most of these travelers rested and marveled at the unusual rock formations, some even drawing sketches or taking photographs of The Witches. Between 170 and 40 million years ago, western North America experienced a mountain-building period called the Sevier orogeny. Dense oceanic crust beneath the Pacific Ocean collided with and moved under the lighter continental crust of North America. This convergence generated compressional forces that produced low-angle thrust faults within the crust. Transported tens of miles eastward along these thrust faults, rock formations were pushed up and over adjacent rock layers, forming the Sevier mountain belt. The conglomerate of the Henefer Formation was deposited about 90 to 85 million years ago when Sevier thrust faulting in Utah had reached its peak. The conglomerate is composed of sandstone and quartzite pebbles, cobbles, and boulders eroded from the mountainous areas to the west and northwest. Streams then carried these sediments off of the highlands, eventually depositing the heavier material in large alluvial fans (fan-shaped stream and debris-flow deposits). 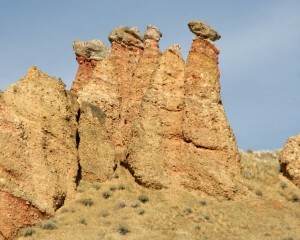 In more recent times, the elements have eroded areas of the conglomerate near Echo and within Echo Canyon into the fantastic shapes we see today; in addition to The Witches, there are rock structures named Pulpit Rock, Castle Rock, Devils War Club, Sphinx, and Sentinel Rock, to name a few. The upper “caps,” or witches’ hats, are formed of a lighter-colored conglomerate layer cemented into a harder mass than the softer, underlying conglomerate layer that forms the witches’ “robes.” The harder cap rock erodes more slowly and helps protect the rock underneath. But as a witch becomes more and more slender, her hat eventually falls off and can no longer protect her, and thus, like the infamous Wicked Witch of the West, she succumbs to the effects of water and gradually melts to the level of the surrounding landscape. From the south and west, travel along I-80 East to exit 169 (Echo) at the entrance to Echo Canyon. At the bottom of the offramp, turn left (north) to go under the interstate. Take a left (west) onto Echo Canyon Road heading towards the town of Echo. Continue on Echo Canyon Road/Echo Road/Old Highway 30 for approximately 2 miles (passing Echo). A landmark sign for The Witches will be on the right (east) side of the road. From the north, travel along I-84 East to exit 115 (Utah State Highway 65/Henefer/Echo). Turn left (east) onto Main Street, cross over I-84, and as you curve to the right (south) towards the town of Echo, the road becomes Echo Road/Old Highway 30. Continue for approximately 2 miles until you reach The Witches landmark sign on the left (east) side of the road.